Oval Turquoise Beaded Bracelet by Chili Rose Beadz. 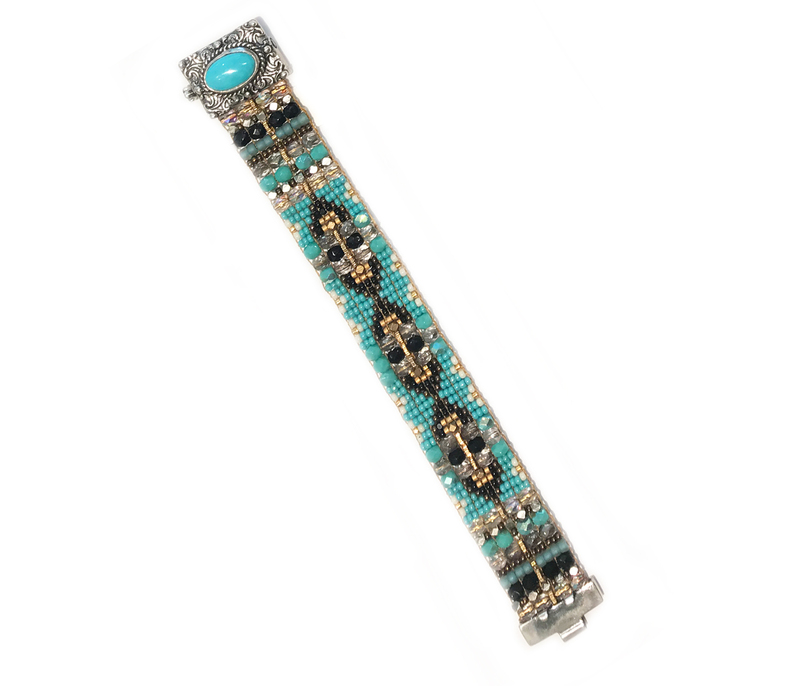 This striking bracelet features an oval piece of sleeping beauty turquoise set in sterling silver with beads loomed in a rug pattern. The bracelet is 6 3/4″ inch long with a slide clasp closure. Adonnah Langer hand looms Czech and Japanese seed beads with Czech fire-polished and brass beads into intricate, sparkling patterns. End caps, clasp and chain in sterling silver. Exclusive bracelet handmade in USA. Influenced by Native American rug patterns and global woven bead traditions, Adonnah continues to create new stunning works of wearable art. She uses Japanese seed beads and Czech fire polished beads in traditional patterns. The bracelets are finished with one-of-a-kind artisan design. We can have these custom made to fit your wrist if the measurements above will not fit. Just give us a call. Chili Rose Beadz founder, Adonnah Langer is a shamanic artist, spiritual counselor and group leader. Her love of weaving, color, and beaded jewelry, as well as her appreciation for cowboy and Native American art is instantly apparent in her jewelry design. Her Lebanese, Irish, French, and Navajo ancestry results in unique design sensibilities combining European tapestries with Middle Eastern and Native American rug designs. Langer’s beaded bracelets are hand made using intricate weaving techniques, which take many hours to create and produce. Her work combines fire polished Czech beads, Japanese delica, seed beads, brass, pearls, and semi precious gemstones to create complex and unique textured bracelets. 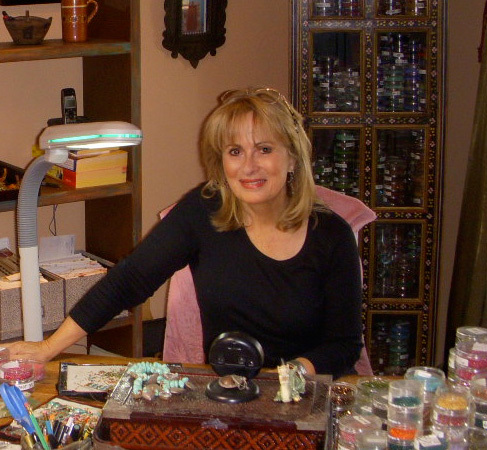 She designs the gold and sterling claps, which are set with semi precious stones. The History of Czech Glass Bead Making is closely allied to the impact that the First and Second World Wars, and the subsequent Cold War, had on the area as a whole. The region where glass making production is centered was formerly known as North Bohemia. Hence the descriptive term sometimes used, namely Bohemian Glass beads. North Bohemia had been a European glass manufacturing centre since the 13th century largely because it was rich in the natural resources needed for glass making. Supplies of quartz, which was mined, and potash from the regions forests, and a by product of the wood burned to heat the glass, made it the ideal location. The cities of Jablonec, Stanovsko and Bedrichov (or modern Reichenberg) all produced glass beads, mainly for use in rosaries, but from the second half of the 16th century, when costume jewelry become fashionable, they started producing beads to be used more decoratively. The Industrial Revolution of the 19th century saw the development of machines that allowed mass production of moulded pressed glass beads, so thousands of identical beads could be produced cheaply. The mechanically shaped beads were a real innovation in terms of glass making history, as little had changed technically for many centuries. These pressed beads were not made around a traditional glass mandrel, but instead a rod forming the hole was pushed into the mould, and this meant that the hole could theoretically be placed in any position and multiple holes could be introduced. The moulds allowed complex shapes to be made and by making use of patterned canes, or the glass rods fed into the machine, the resulting beads could be elaborately colored, giving them a slightly random appearance, even if the shape was exactly the same. In time these differing colorings, shapes and finishes resulted in Czech Glass Fire Polished beads, Czech Glass Aurora Borealis beads, Czech Glass Flower beads, and Czech Glass Swirl beads, Czech Glass Picasso beads, and Czech Glass Satin beads, with Preciosa alone now boasting 425,000 different beads and jewelry components in its range. This sense of mass production saw the expansion of the industry and Czech Glass beads were exported around the world. However, the actual making of the Czech pressed glass beads, on the whole, remained a cottage industry, in that machines and moulds were bought and used by individuals and families who would work from home to supply the companies that would then trade the beads. As can be seen below family homes that produced glass beads could be identified quite easily by their tall chimneys and roof vents.